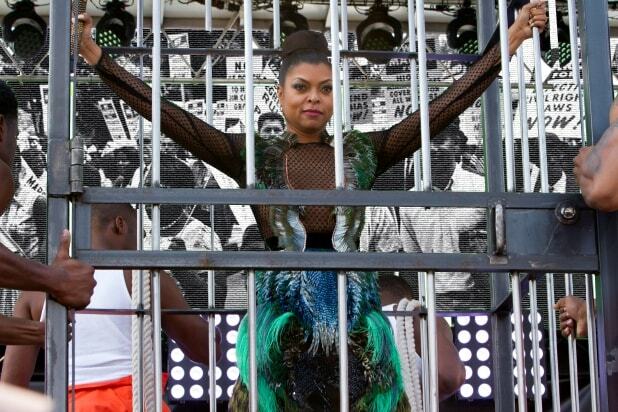 That’s what the freshly-jailed record label head Lucious Lyon (Terrence Howard) growled from his cell at the end of Season 1 of “Empire.” The opening of Season 2 lives up to that decree, with alliances shifting from their most recent realignments, and each member of the Lyon family trying to out-manipulate his or her fellow shareholders. The premiere begins with co-founder and ex-wife Cookie (Taraji P. Henson) staging a #FreeLucious concert three months after his imprisonment, corralling their children Jamal (Jussie Smollett) and Hakeem (Bryshere Y. Gray) to perform at the concert despite being well aware that their cold-blooded father did commit the murder for which he was jailed. The concert acts as a kind of greeting from the show directly to the audience in these opening scenes, catching up from the news cycle of the last several months by immediately addressing Ferguson and the Black Lives Matter movement as a backdrop for the concert, though the latter isn’t specifically mentioned. “How much longer are they gonna treat us like animals? The American correctional system is built on the backs of our brothers, our fathers, our sons. It is a system that must be dismantled piece by piece,” Cookie pleads on stage in front of thousands at the #FreeLucious concert. It cuts to commercial at the end of her speech, perhaps signaling the show’s espousal of Cookie’s statements as its own. Her choice is of a piece with the rest of the moral quandaries the characters experience in the show: choosing one out of a few nearly-equal terrible options, inflicting smaller hurts in the service of a larger benefit–so each family member claims at some point or another. The fight for control of the “Empire” label continues with Cookie, Hakeem and eldest son Andre (Trai Byers) scheming to wrestle control away from Lucious and his appointed successor Jamal with the help of a lesbian investor played by Marisa Tomei–whom we’d describe in some other way except that’s all we’re told about her. She’s a lesbian. She’s an investor. And from within the prison walls, another drama unfolds. An old connection from the Lyons’ drug-dealing days is out for Cookie. Lucious, already set up with a few prison manservants, seems to relish the return to the bullying he was accustomed to dishing out well before he tortured his enemies with buyouts and tabloid scandal. One arc we can expect to see in season two is the transformation of Jamal, who was once the unassuming, tender-hearted artist at the center of a family so obsessed with power and control. Now, as the ascendant king of the label, Jamal is morphing into the Michael Corleone of the Lyon family: A sensitive innocent who may blossom into a ruthless mastermind.